The Loft is in a small 19th century building in the historic town center of Nîmes and has been completely renovated keeping it's original charm. There are 2 balconies and a small veranda bringing in light from the boulevard and courtyard. 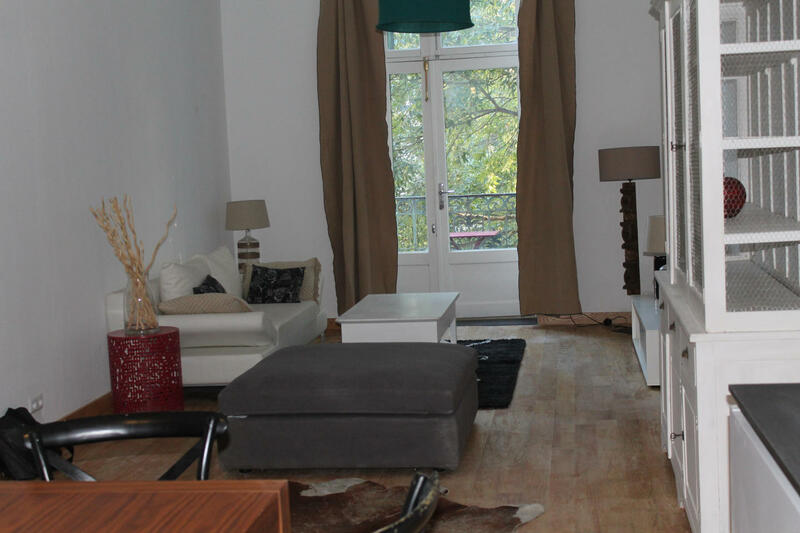 One large space, very open with lots of light, the loft is situated in a quiet street and is within easy walking distance to all of the major tourist attractions and Roman monuments as well as the lively Nîmes markets, restaurants and museums. There is a fully equiped kitchen opening onto the living/dining room. 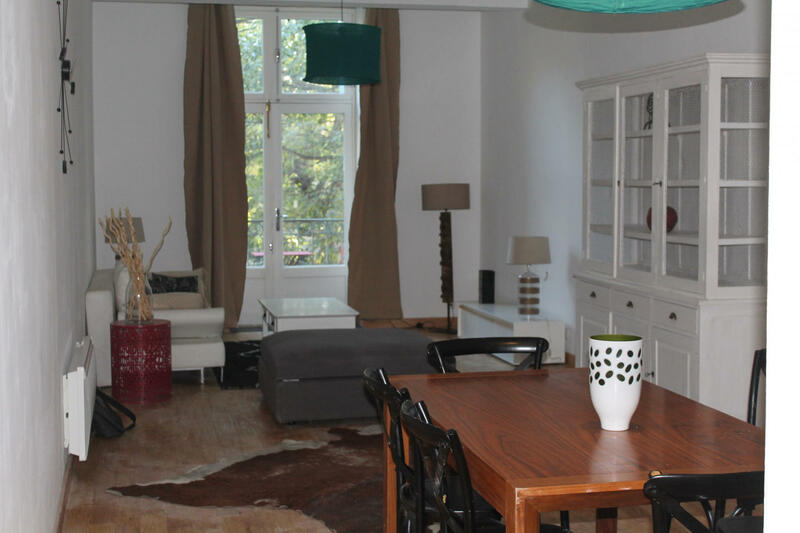 Situated on the 2nd floor, there is a balcony opening onto a leafy boulevard. The bedroom is very large and spacious. There is a double bed and plenty of cupboards and storage. 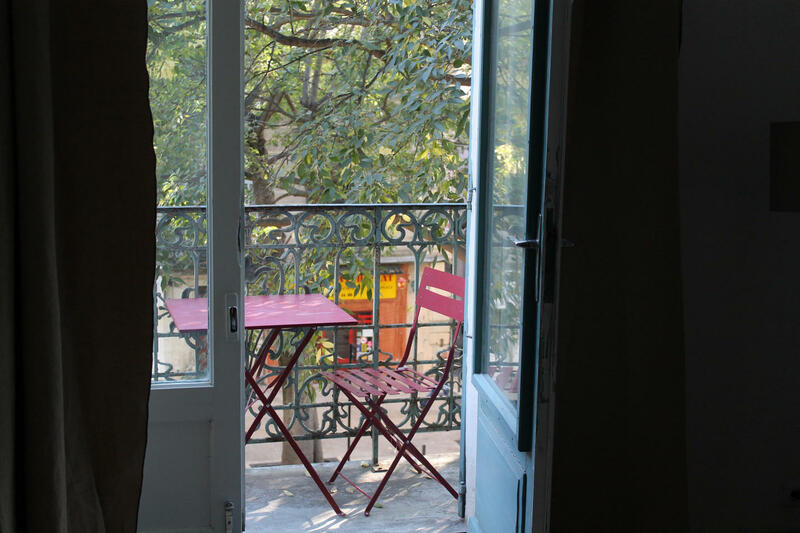 There are french doors opening onto a second balcony looking over a small courtyard. The bathroom has been fully renovated. There is a seperate toilet which is accessable from a small verandah. All linen is provided during your stay. The Loft is full of charm and offers all that you need to make sure that your stay is as comfortable and pleasant as possible. We have lived in Nimes for almost 30 years and have adopted this wonderful town as our home. We would be very happy to help you discover all that Nîmes has to offer as a local. The Loft is in the heart of the old town of Nîmes. Situated in a small street, there is not much noise to disturbe you. You are in easy walking distance to visit all that Nîmes has to offer. The Loft is only 10 minutes on foot to the train station. Other public transport allowing you to visit surrounding towns and attractions stop just in front of the building where the Loft is situated. The beautiful city of Nimes is renowned for its immaculately preserved Roman heritage, epitomised by its visually stunning Roman Arena. It is also an interesting cultural centre, home to many museums, festivals and events. The Arena of Nîmes is by far the most popular attraction in the city. It is especially beautiful when illuminated come night. Many relics from Nimes’ Roman past are available to be explored. The ancient Maison Carree (best preserved Roman temple) is one of the most striking places to see. Although Nimes is best known for its ancient Roman sites, there are many modern attractions to be found in the city. Enjoy a drink on Boulevard Victor Hugo, one of the city’s most buzzing nightlife spots, or have a family day out at one of the many beautiful parks in the area. Nîmes is an excellent starting point to visit the many attractions nearby? The famous Pont du Gard Roman aqueduct is just outside of Nimes and is a certified Unesco World Heritage Site. In easy travelling distance, you will find Avignon and it’s famous theatre festival in Juillet, Les Baux de Provence in the provincial Alpilles mountains is considered one of the most beautiful villages in France and the The Camargue regional park and natural reserve is a sancturary for fauna and flora ans is the capital of the famous gypsy culture in the region.